Kyocera Corporation (President: Hideo Tanimoto; herein “Kyocera”) and Tokyo Century Corporation (President & CEO: Shunichi Asada; herein “Tokyo Century”) announced today that Kyocera TCL Solar LLC (herein “Kyocera TCL Solar”) has started operation of Japan’s largest*1 13.7 megawatt (MW) floating solar plant this month. Located on the Yamakura Dam reservoir in Ichihara, Chiba Prefecture, the Company held a completion ceremony on March 20 with Kensaku Morita, the Governor of Chiba Prefecture. Kyocera TCL Solar is a joint venture of Kyocera and Tokyo Century established in 2012 to promote large-scale solar projects. The plant was constructed over the surface of the reservoir, which is managed by the waterworks bureau of Chiba Prefecture for its industrial use. With 180,000m2 (over 44 acres) of surface area, 50,904 Kyocera solar modules were installed to generate an estimated 16,170 megawatt hours (MWh) per year —　enough electricity to power approximately 4,970 typical households*2. All power generated is sold to TEPCO Energy Partner, Incorporated. The project was originally initiated by the Public Enterprises Agency of Chiba Prefecture seeking companies to help reduce its burden on the environment. 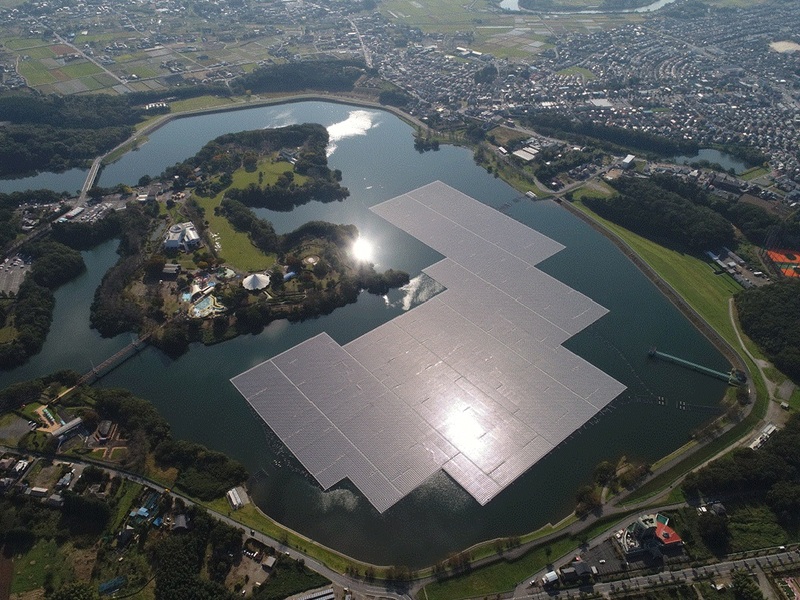 Since its establishment, Kyocera TCL Solar has constructed 61 solar power plants*3 across Japan including the nation’s largest floating solar project, the 13.7MW plant at Yamakura. The Company has developed seven floating solar power plants using Japan’s fresh-water dams and reservoirs rather than agricultural land, for it is becoming more difficult to secure tracts of land suitable for a utility-scale power plant. Kyocera TCL Solar, Kyocera and Tokyo Century, will remain committed to promoting renewable energy as well as contributing to environmental protection and the creation of a sustainable society. *1 Japan’s largest floating solar power plant in terms of output among those currently in operation. Claim is based on research by Kyocera TCL Solar LLC (as of March 20, 2018).